For my new solar ystem, I was intending to put a radiator in the loft to act as a heat dump but I wonder if there is a more elegant solution. My SF Rayburn uses gravity heating to heat the vented cylinder. A central heating feed is Tee'd off from the flow pipe and an injector T ensures that the action of the CH pump does not adversely affect the return flow from the cylinder to the boiler. Would the CH pump in this system be useful as a heat dump during the summer when the Rayburn is not lit and at a time when the solar system is more likely to overheat? Clearly, I would have none of the electrical issues that conventional boilers have when integrating a solar heat dump with CH (Antman's diagrams refer). Of course, the TDC3 would have no difficulty in controlling the CH pump via R2; my question is whether this solution would be effective at dissipating excess heat in the cylinder? If my description of the Rayburn system is unclear, I could scan in a diagram of the existing system if that would help. Many thanks once again, Rob. OK...no replies.....I think I meant "thermo-syphon" rather than "gravity" in my original thread and I may have confused folks. . Here is a picture of my existing Rayburn system. The pump is in the "Alt" position of the 2 positions shown in the diagram and is currently operated by a simple hand operated on/off switch. What I am trying to ascertain is if the pump was running with the Rayburn cooker extinguished, would it remove heat from the cylinder and therefore usefully act as a heat dump for when I fit my solar system? To do this, the pump would have to induce a flow through the boiler coil and back to the cooker and I'm not sure if the injector Tee would allow this to any useful degree. If it would then I could use the TDC3 to operate the pump during overheat conditions. Hopefully my question is a little clearer and thanks in advance for your views. I've not have anything to do with SF gravity systems but gut feeling is that you may not be able to guarantee flow from the coil. The pump flow will predominantly take the path of least resistance - which may turn out to be via the Rayburn. The cylinder, being hot and above the circulating loop may tend to resist flow from the top of the coil. You are right in that when the CH pump is running, the use of a injector tee on the return, will (to some degree) induce some flow around the primary gravity circuit (that's it's job) even when the Rayburn isn't alight. How effective it is overall will depend on the pump speed, pipework etc. 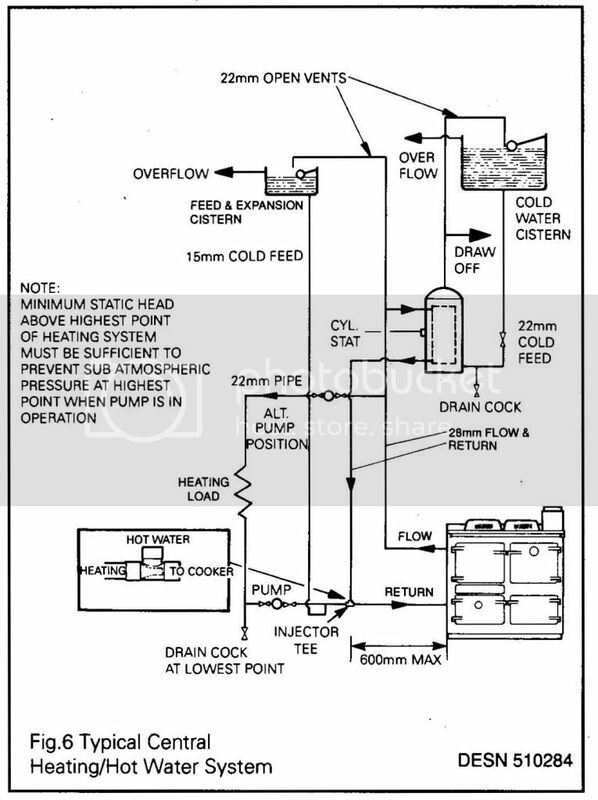 Another thing to consider when connecting a pumped CH system and/or using a injector tee etc, to assist a gravity circuit (or using pumped primaries) is that the flow through the Rayburn etc may be a little too fast at times and may therefore run too cool, resulting in a inefficient/polluting burn and may lead to condensation, causing a build up of tar and back-end corrosion around the boiler/flue. To avoid this, at the very least, the pump should be controlled by a low limit pipe stat, so that it automatically switches off when the primary return temp drops below around 55 to 65 degC. Mother Nature is a wonderful housekeeper - but eat her out of house and home and you may just get your marching orders. Thanks, Lightfoot. I have discovered that there is a low limit stat on the return line in the cooker, but the cable is not connected to anything!! That aside, perhaps it is not a good idea to circulate water through the boiler when the fire is out owing to potential corrosion problems? This could be a problem as the heat dump is likely to be required in the summer when the Rayburn is not in use. Perhaps it would be safer to use a loft radiator heat dump. Any views?